Fast-paced, suspenseful, and utterly satisfying, The Demon Under the Microscope is a sweeping history of the discovery of the first antibiotic and its dramatic effect on the world of medicine and beyond.The Nazis discovered it. The Allies won the war with it. It conquered diseases, changed laws, and single-handedly launched the era of antibiotics. This incredible discovery was sulfa, the first antibiotic medication. 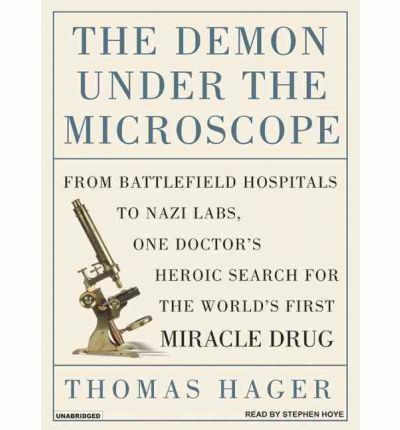 In The Demon Under the Microscope Thomas Hager chronicles the dramatic history of the drug that shaped modern medicine.Sulfa saved millions of lives-among them Winston Churchill and Franklin Delano Roosevelt, Jr.-but its real effects are even more far reaching. Sulfa changed the way new drugs were developed, approved and sold; transformed the way doctors treated patients; and ushered in the era of modern medicine. The very concept that chemicals created in a lab could cure disease revolutionized medicine, taking it from the treatment of symptoms and discomfort to the eradication of the root cause of illness. A strange and vibrant story, The Demon Under the Microscope illuminates the colorful characters, corporate strategy, individual idealism, careful planning, lucky breaks, cynicism, heroism, greed, hard work, and the central, though mistaken, idea that brought sulfa to the world. This is a fascinating scientific tale with all the excitement and intrigue of a great suspense novel. About the Author: Biographer and science writer Thomas Hager has written or edited five books on medicine and science, most recently The Demon Under the Microscope. Hes the author of two books on Linus Pauling, including the acclaimed biography, Force of Nature: The Life of Linus Pauling. He lives in Eugene, Oregon.